Is there really such a thing as allergies? 1 out of 5 people in the U.S. are now “allergic” to allergens such as tree pollen, dogs, cats, foods, grass, molds, dust and more while reacting with itchy eyes and skin, rashes, wheezing, coughing, sneezing, congestion and the like. By the way, allergens are anything that cause allergies. While reading all of this, please keep in mind that a weakened immune system is considered a precursor to many other diseases and even cancer, and therefore this subject demands our utmost attention, especially those of us with children. To break it down, by definition, “allergies” are an abnormal immune response to a generally harmless substance. Okaaay, so, in other words, 1 out of 5 people have abnormal immune responses to substances that don’t bother most of us. That number would be much higher if you included asthma and other immune disorders. But moving on. Calling something an allergy is really only helpful to those trying to sell you something to fix that allergy and not interested, at all, in your overall health. Or at least they don’t grasp the concept of holistic or functional medicine. Because really, what are the two most marketed ways to beat allergies? Stay away from the allergen or take drugs. Let’s pretend for a minute that you don’t have allergies. Instead, you have an IRS disorder; I know, I just made that up, and it sounds like you owe money, but bear with me for a second. Since we now know that everything from antibiotics to stress and poor nutrition can suppress the immune response in our body, it would make sense that we could be creating our own “allergies” by the way we live our lives, and what we did in the past. This means that it’s not the dog or trees fault for making us cough and itch; it’s our lifestyle and/or history. IRS Disorder is a weakened immune system that is incapable of responding appropriately to foreign invaders or simply managing day to day chores. Over time this leaves the body vulnerable to a long list of possible diseases and symptoms, all varying based on a person’s own bio-individuality and history. In other words, when the body is abused for long enough or in the “right” ways, the immune system becomes weak and the body vulnerable to allergies and other diseases. This long list of maladies resembles exactly what is seen today in America’s doctor’s offices and all over the world, but unfortunately, many of them go misdiagnosed because so much of health care is focused on trying to treat symptoms without finding the cause, holistically. This means, that while allergies are common in the same family, what they are allergic to is not the same. In other words, a weak immune system can be passed down, or merely developed via a similar environment, and cause vulnerability to different allergens based on one’s own bio-individuality. 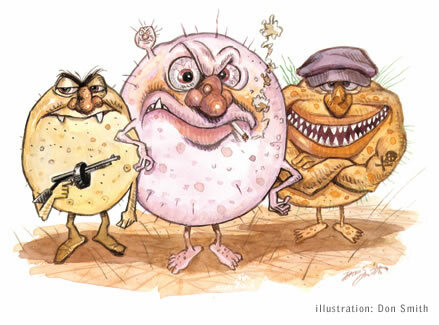 JUST TO BE CLEAR, OVER 80% OF OUR IMMUNE SYSTEM FOR THE ENTIRE BODY LIVES IN OUR GUT, AND ITS VIGOR IS DEPENDENT ON THE WINNER OF THE BATTLE; GOOD BACTERIA VS. BAD BACTERIA. Many holistic and functional medicine doctors believe that when the battle is won by the bad bacteria, the flood gates for uncountable diseases open. Read what one of Functional Medicine’s leading doctors, Dr. Mark Hyman, thinks about this battle here. Allergies and sensitivities to odors, chemicals, foods, environment and sounds. What CAUSES the BAD BACTERIA to outnumber the good? Occasionally flush them out with a natural, high fiber concoction, Perfect 7 is my favorite. In closing, I understand that there are certain circumstances that require severe treatment and occasional drug intervention, like peanut allergies and others, but these are rare and not what this post is about. This post is about what you can do for yourself to create an environment inside your body that will make it so healthy, allergens cannot cause allergies. So, still think you have “allergies”, or do you have an IRS disorder?